LeBron James signing with the Los Angles Lakers on July 1 was the best news for the Eastern Conference. Of all the teams in the East, however, no team was sighing a bigger relief than the Toronto Raptors. The Raptors have been rocked in the playoffs the last three years by LeBron and the Cleveland Cavaliers. The 2016 Eastern Conference Finals saw the Raptors and Cavaliers go to six games, but all four victories by the Cavaliers were by a margin of 19 or more. Compound the 2016 loss to sweeps in 2017 and 2018, and LeBron currently holds a 10-game win streak over the Raptors in the playoffs. With James in the Western Conference now, the East has been wide open. The Raptors made one of the biggest moves this off-season when they traded DeMar DeRozan to the San Antonio Spurs for Kawhi Leonard. This move was criticized by many because the Raptors were for giving away an all-star player who had been loyal to Toronto and had a great relationship with fellow all-star Kyle Lowry. However, the Raptors' woes in the playoffs had been amplified to places that general manager Masai Ujiri felt that change was needed. So he fired the coach of the year Dwane Casey and traded the best player in franchise history to maybe change the fate of the franchise. Trading DeRozan for Kawhi also gives the Raptors flexibility if Kawhi were to leave in free agency in the summer, which most people are assuming he does. 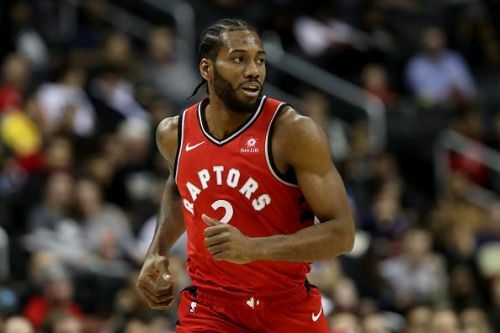 However, if Toronto can re-write their playoff struggles and make the NBA Finals and maybe win the title, the hope could be that Kawhi re-signs with Raptors a la Paul George with the Thunder. The assumption with Paul George was that he was going to sign with the Lakers following his one year with the Thunder last year. It turned out that George liked playing in Oklahoma City and playing next to Russell Westbrook, and signed a three-year deal with a fourth-year player option to stay with the Thunder. Kawhi is a better player than DeRozan and the trade has been a success so far for the Raptors. He does more on the defensive end. He is a better shooter than DeRozan. And while DeRozan figured out how to co-exist with Lowry as a secondary ball handler, Kawhi has figured out similar ways to help the Raptors offense. The Raptors could knock off the Warriors as new NBA Champions because they have developed excellent role players around Kawhi, who is a borderline MVP candidate. Pascal Siakam has seen huge leaps this year in becoming one of the best two-way players in the NBA. His ability to guard all five positions and be one of the anchors of the defense along with Kawhi makes him invaluable. Add the fact that he is an amazing cutter and is shooting 37% from three, and Siakam is a 3 and D on steroids. At the trade deadline, the Raptors made another bold move in parting ways with their longtime center Jonas Valanciunas for Marc Gasol. The addition of Gasol bolsters the Raptors' bench unit and gives them another defensive anchor. It also gives them a better rim protector and offensive center than Valanciunas ever was. Gasol, Fred VanVleet, Jeremy Lin and OG Anunoby are all starting caliber players that make up the bench unit for the Raptors. Their depth is something that should scare teams when playoff time comes around. The Raptors always prided themselves on having depth in the past and it was usually their stars Lowry and DeRozan that would struggle in the playoffs. Now with Kawhi, the new look Raptors hope to break through the wide open East and make the NBA Finals, something the franchise has never done. And with no LeBron roadblock anymore, there is no reason why they won't.